The life of astrophysicist Jill Tarter is chronicled in a new book by science writer Sarah Scoles. A new book by science writer Sarah Scoles profiles radio astronomer Jill Tarter, a pioneer in the search for intelligent life beyond Earth. Even if you haven't heard of Tarter, you might know the fictional alien hunter she inspired — Ellie Arroway, from the movie "Contact," which was based on the book by Carl Sagan. The character was based on Tarter, who was a driving force in what became known as SETI, or the Search for Extraterrestrial Intelligence. Tarter helped transform SETI from a somewhat dubious field in the 1970s to a more organized effort that is accepted by the mainstream scientific community today. "She kind of fell into SETI work," Scoles told Space.com. Scoles' book, "Making Contact: Jill Tarter and the Search for Extraterrestrial Intelligence" (Pegasus Books), was published earlier this year. Scoles said early SETI efforts faced serious scientific, political and financial challenges, causing the field to move forward in fits and spurts. Although Scoles acknowledges that scientists work together to build up and establish their fields, she said Tarter served a unique and perhaps irreplaceable figure. "Making Contact: Jill Tarter and the Search for Extraterrestrial Intelligence" (Pegasus Books, 2017). Born in New York in 1944, Tarter (born Jill Cornell) spent her childhood with a father who encouraged her to dream, according to Scoles' book. Despite growing up in time where traditional gender roles were more regimented, she decided at a young age to be an engineer. "Why do you want to take calculus? You're just going to get married and have babies," Tarter recalls a high school guidance counselor telling her. (She managed to do all three.) When she completed Cornell University's five-year undergraduate engineering program in 1965, she was the only woman out of 300 students. Tarter's father, who told her she could accomplish anything as long as she worked hard enough, died when Tarter was 12. Her mother, who had encouraged her daughter toward more feminine roles, continued to provide her with quiet support after her father passed away, according to Scoles' book. "I think that her mom being forced into this nontraditional role [of a single mother] maybe made her more accepting of [a nontraditional role for] her daughter," Scoles said. And while her father had pushed young Jill to fulfill her dreams, "what she learned from her mom were the practicalities of how to work hard and get things done," Scoles said. "Her mom was the practical complement to her dad's dreaminess." Are we the only intelligent life in the universe? See how we intend to find out in this full infographic. In addition to her bachelor's degree in engineering physics, Tarter earned a master's degree from the University of California at Berkley, followed by a doctorate in astronomy in 1975. During her junior year at Cornell, she married Bruce Tarter. Between undergraduate and graduate school, she gave birth to their only child, a daughter, Shana. Her marriage to Bruce struggled under the weight of her growing responsibilities. Eventually, the two divorced, and Tarter married fellow radio astronomer William "Jack" Welch. Early in her career, Tarter came across a paper in the scientific journal Nature on the need to hunt for signals from advanced alien civilizations, according to Scoles. "The probability of success is difficult to estimate, but if we never search, the chance of success is zero," the paper read. The idea sparked her imagination, and Tarter quickly became a proponent of SETI. The young field suffered a lot of blowback from scientists, according to Scoles, as researchers tried to determine if hunting for signals from alien civilizations was a serious scientific pursuit or a waste of time. As a woman in astrophysics, which was (and continues to be) a male-dominated field, Scoles said it might have been easier for Tarter to get started in the fringe field "because she was already kind of a fringe character just by being a woman in this particular science." While some scientists may have been reluctant to enter the search for alien signals, Scoles said that Tarter wasn't as concerned because she was already unusual. "There was a lot less stigma attached because everyone was already [saying], 'What [is] that girl doing?'" Scoles said. Not long after its 1971 publication, Tarter received the NASA-sponsored Cyclops report, a 250-page document on humanity's ability to hunt for intelligent extraterrestrial life that was instrumental to SETI. According to Scoles' biography, Tarter didn't put the report down for two days. When she finished, she knew she wanted to be part of the search. Tarter joined the Search for Extraterrestrial Radio Emissions from Nearby Developed Intelligent Populations (SERENDIP), a project headed by fellow astronomer Stuart Bowyer, who had given her the Cyclops report. Today in its sixth iteration, SERENDIP hunts for signals from advanced civilizations by piggybacking on existing radio astronomy observations. In 1984, Tarter wrote the charter for the SETI Institute, a nonprofit research organization. According to Scoles, the organization started out as a way to save NASA money, since the agency was funding the bulk of SETI research at the time. By separating them from the government, scientists could fundraise and accept donations while also applying for research grants that used federal funds. The divide also allowed SETI researchers to pursue what Scoles called "risky projects [that] NASA and the National Science Foundation didn't approve of but which turned the heads of the public and a few key philanthropists." The institute proved a lifesaver once NASA began decreasing its budget for SETI research in the late 1980s. Tarter spent 1989 lobbying in Washington, D.C. Although some senators thought hunting for signals from other civilizations was "a fine idea," others found it irrelevant, since results couldn't be guaranteed in what Scoles called "a politically relevant time frame." In late 1993, the hunt for other civilizations was cut from NASA's budget. In her book, Scoles said the SETI Foundation is what saved SETI. Today, the SETI Foundation not only hunts for signals from alien civilizations but also studies newly discovered exoplanets, hunts for hardy extremophiles on Earth that could give clues about how extraterrestrial life could evolve, and even studies our own planet. Under Tarter's guidance, the SETI Institute built the Allen Telescope Array, relying on private donations to create a radio telescope that could hunt for signs of radio communications being transmitted by an intelligent alien civilization. The initiative to build a dedicated SETI array came from a series of 1997 workshops Tarter participated in, and culminated in the birth of 42 radio antennas, positioned in the Cascade Mountains in Northern California. The array began observations in October 2007. When funding dried up for the project, the array was sold to SRI International, a scientific nonprofit organization that uses it to probe objects orbiting Earth. Tarter negotiated evening use of the array for the SETI institute. By the 1990s, Tarter had become a crusader for the cause, juggling both the science of the growing field and the challenges of politics and funding. Tarter retired as director of the SETI Institute's Center for SETI Research in 2012, but she has continued to share her enthusiasm for the hunt. She's presented TED talks about SETI and been a guest on numerous podcasts. In 2004, she was named one of Time's 100 most influential people in the world. "She's become more public in the last 10 to 15 years," Scoles said. "I feel like more people have heard of her now than before she was retired." In researching the biography, Scoles said she spent a lot of time with Tarter, whom she describes in her book as "a fierce, stubborn, smart woman who asked big questions about the universe and didn't hear 'No' as 'No' but as 'Keep trying.'" The key to Tarter's success, Scoles said, was her flexibility. "Gradually, it became clear that she couldn't exactly set the path for how her life was going to go," she said. "She just became open to possibilities and, I guess, prepared for them. "She was willing to abandon her own schedule for herself and see opportunities as they presented themselves rather than sticking very rigidly to a plan she had made before," Scoles said. 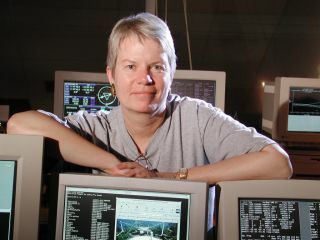 Astrophysicist Jill Tarter, shown here on a platform above the Arecibo radio telescope while she was working at NASA's Ames Research Center. Tarter went on to become a leader in the search for intelligent life beyond Earth. Tarter's work in the hunt for extraterrestrial communications put her in contact with the well-known scientist and public figure Carl Sagan. According to Scoles' book, Tarter was surprised that their few brief professional meetings were enough to earn her a starring role in "Contact." Scoles said that the character of Ellie Arroway — in both the book and subsequent film — is very similar to Tarter. "I think that, aside from the fact that [Arroway] finds aliens in the movie, it's pretty accurate to [Tarter's] personality," she said. It was this movie that set Scoles on the path to becoming a radio astronomer when she was 12. "I didn't know radio astronomy existed until I watched that movie," Scoles said. "I thought it was so cool that there was a science where you were essentially looking at space, but at the parts you couldn't see, and that there were some who were using it to look for aliens. That was like a double whammy of very cool things I didn't know people did for jobs." Scoles studied radio astronomy at Agnes Scott College in Atlanta, serving an internship at Green Bank Observatory after her first year. Green Bank's radio telescopes was one of the first to hunt for SETI signals, and during her internship, Scoles stayed in the former house of SETI pioneer Frank Drake. Although Scoles ultimately decided to pursue a career communicating about science and astronomy, she credits "Contact" with kicking off her interest in the field. "I think a lot of people had experiences like me," she said. "[Contact] inspired a lot of people of a certain generation." Her fictional fame isn't something Tarter shies away from, Scoles said. When she asked the scientist how it felt to have such a well-known alter ego, she said that Tarter seemed glad to think that the movie inspired so many people to pursue a career in science. By advancing the hunt for extraterrestrial life before there was even proof of planets existing beyond Earth's solar system, Scoles said that Tarter helped prepare researchers for a time when thousands of worlds would be known to exist around other stars. Her role as a researcher, combined with her ability to maneuver around bureaucratic hurdles, made her invaluable. In the book, astronomer Margaret Turnbull testified to "the enormous impact that Jill has had — and that thanks to her we [exoplanet and SETI scientists] are all continuing to have — on the world, just by simply existing and being in the scientific community and pushing the frontiers in every direction." "She's not replaceable," Turnbull said. Follow Nola Taylor Redd at @NolaTRedd, Facebook, or Google+. Follow us at @Spacedotcom, Facebook or Google+. Originally published on Space.com.